Get peace of mind with a lifetime guarantee on residential electrical panels for Minneapolis area homeowners. 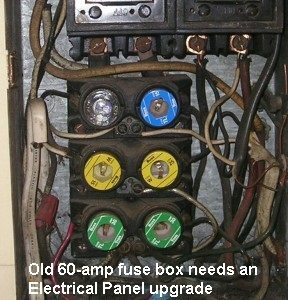 Many homeowners still have a fuse panel or 60-amp service that is no longer legal or safe. See the photo on the left as an example. When it comes time to sell your house or if you take on a remodeling project, you’ll want to upgrade your electrical panel. Of ‘course, safety should also be a strong concern. You may be experiencing frequently tripped breakers and other overload issues that are not just inconvenient, but dangerous. See our electrical safety tips to help protect your family from electrical fires and other dangers. You might upgrade your electrical panel to gain more circuit space, convert to circuit breakers instead of fuses (which are hard to find these days), to have better over-current protection, or to bring your electrical systems up to code. Electrical panels come in different sizes. A typical residential panel is 12 to 20 circuits. But we install a 30 circuit panel to give you more space for the same price! Your new panel won’t be full the minute it is upgraded. You can plan for future expansion – like a basement remodel or addition – without having to later install a sub-panel. 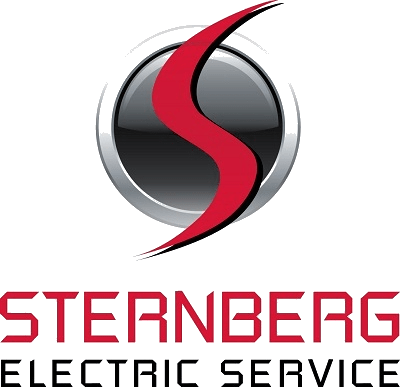 Sternberg Electric is a fully credentialed Minneapolis electrician – competitively priced and providing the expertise and ethical business practices to exceed your expectations. State law requires the use of Arc Flash suits while working on electrical panels. We have taken this safety measure a giant step further by completing 70E NSPA Arc Flash Training for all employees. Enjoy peace of mind that safety is our priority. We provide Minneapolis area homeowners with electrical panel installation, upgrades, and repair. Our electrical troubleshooting expertise is exceptional. We save you money by being accurate and efficient. We’ll charge you for our time troubleshooting and present an estimate in order to solve the problem. But if we can’t find a solution to the problem, you don’t pay anything. In most cases, installation, upgrades, and repair are completed in one day with minimal power downtime. We have over 30 years experience, and we provide you with a lifetime guarantee on residential electrical panels services.